Today I’ve been mostly looking at reports of the terrorist bomb in Jerusalem. – though in my book, reversing these two events gives precedence to the wrong one. You beat me to it, sue. I was just about to put something together showing how the BBC Arabic service reported this to the other side. Notice how they place the blame for this squarely on Israel and point out that the bus was headed for the (“illegal, although, etc.”) settlements, and censor the news about exactly to what Israel’s attack was responding. The BBC Arabic sub-editor also included the President’s condolences to the Gazan victims, which was censored from the English version. It’s pretty damn unbelievable to see the two faces of the BBC in full flower like this. Here’s the original in Arabic, and I’ll reproduce a Google translation in full below (In two parts due to character limits). Everyone can decide for themselves what to make of it. An explosion on Wednesday near the central bus station in Jerusalem, killing an Israeli and wounding about thirty. Said Shireen Younes us, quoting Israeli police sources said the blast occurred during evening rush hour as a bus near the station, which is usually packed with passengers boarding buses to other Israeli towns. The Israeli ambulances rushed to the station to transport the injured, and showed us that the situation of at least three injured seriously. The Minister of the Israeli Internal Security immediately inspected the blast site and said that the blast was caused by an explosive device was placed inside a bag. The minister Isaac Aharonovitch accused Palestinian factions of masterminding the explosion. Reports have suggested that the device exploded as a bus heading to the settlement of Maale Adumim, near Jerusalem. This is the first explosion in Jerusalem years ago, the last in a bus bombing took place in January 2004 while the work of a suicide bomber targeted a bus No. 19. Has postponed the Israeli Prime Minister Benjamin Netanyahu’s visit to Russia to follow up the developments of the situation. The blast came after an escalation in recent days in the Gaza Strip and threats from the Palestinian factions to retaliate to Israeli raids on the Gaza Strip, which finally resulted in the deaths of eight Palestinians. According to witnesses in a number of areas of the West Bank saw some of the roads connecting cities in the West Bank, a proliferation of temporary barriers to the Israeli military in order to check the identities of passers-by from the Palestinians and traveling between Palestinian towns. Proliferation and focus in the Container checkpoint at the entrances to the city of Bethlehem, and the road to the city of Jericho, as well as roads leading to the city of Ramallah. In the first reaction of Western condemned U.S. President Barack Obama, the bombing in Jerusalem. President Obama in turn offered his condolences to the families of Palestinians killed in Gaza. But Gates does not believe the situation can be described Palmtdhor. On the other hand, warned Egyptian Foreign Minister Nabil Arab Israel of rushing to implement the military operation in Gaza. He also warned to give Israel any pretext to use violence, adding that Egypt rejects and condemns the violence against civilians. On the Palestinian side in an exclusive interview with BBC Arabic, “said Abu Ahmed, spokesman for Al-Quds Brigades military wing of Islamic Jihad, they blessed the Jerusalem operation. The Palestinian President Mahmoud Abbas issued a statement condemning the Jerusalem operation. Prime Minister also condemned the Palestinian government in Ramallah, Salam Fayyad, highly explosive and described it as “a process of terror, regardless of the party that stands behind it.” Fayyad and by the hope for a speedy recovery to the wounded. The focus has been on the unrest in Libya and other Arab lands. So Hamas decides to drag Israel back into the picture. Slit a few throats of Jewish children and parents. That doesn’t work. So lob a few missiles into Beersheba and other towns. Israel retaliates by bombing a few Hamas buildings in Gaza. Blow up a bus station in Jerusalem. Hey presto. Its not Ghadafi Egypt, Syria. Its Israel thats the problem! How sick. Let’s see if any of the high quality BBC journalists in the region will make a similar connection. “attacks had stopped in recent years.” Yes I noticed this on the BBC news channel at about 6oc they kept mentioning things along the lines of that the Israelis were not used to this in Jerusalem and it had been a long while ago since the last terrorist attack. It just stuck out as being forced and trying to push a point. This was in the couple of minutes I watched the BBC news during channel hopping. I wonder if they met at right-on Washington soiree. Munayyer’s writings often refer to Israel as an apartheid state. 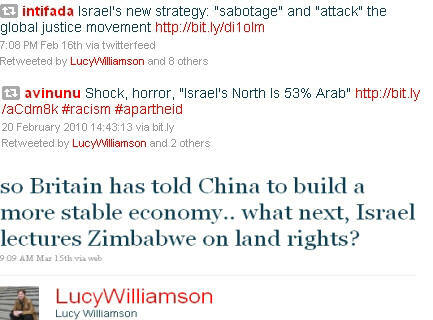 The BBC’s Lucy Williamson promoted the same opinion on her Twitter account last year. It’s almost as if it’s the accepted natural viewpoint within the BBC. But no, that couldn’t be, could it? Lucy Williamson’s smart-alec “What Next” tweet is an example of a lazy incurious know-all seeking the approval of other ignoramuses. One wonders what the BBC are going to do now it turns out the dead victim is British.